According to Patanjali Maharishi, the aim of every spiritual seekers is to attain Peace or Peranandam, by following the disciplines prescribed by our Siddantham or Vedantham Shastras. Just as a river eventually joins the ocean, every individual who has come from Total-Self (Almighty), must ultimately merge with the Total Self. Once this happens, there is no insecurity, unhappiness, worry and anxiety but total joy. One of the best means or sadhanas to achieve this is by practising Classical Yoga of Ancient Mystics from both North India ( Vedanta Yoga ) and South India ( Siddhanta Yoga ). The prevalent misconception about Yoga is that it takes an individual deep into the sub-conscious, which ultimately leads to moksha or self realization. This is a wrong concept. One must understand that Yoga only qualifies a person to study the scriptures, which leads one to moksha. Yoga is only a pre-requisite that helps the spiritual seekers to have healthy sense organs, a subtle mind and sharp intellect, so that the study of Siddhantam, Vedas or other scriptures is a walk over or an easy task. Therefore, it should be understood that Yoga is only a technique to discipline the body-mind complex and means to attain self knowledge through a competent teacher. There are two main Yoga systems in India. One is Patanjali Yoga, teaching Soul-realization and one more is Thirumular Yoga, teaching God-realization. Those who are learning Patanjali Yoga keep Patanjali sutra written by Siddhar Patanjali and for Thirumular Yoga keep Thirumanthiram scripture written by Siddhar Thirumular for reference. 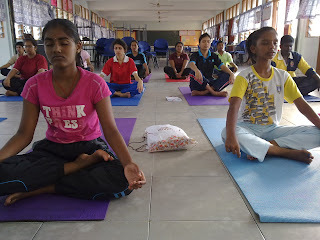 We also conduct "Mind-Sound-Yoga" class for children at Ampang , (30 mins from Kuala Lumpur). 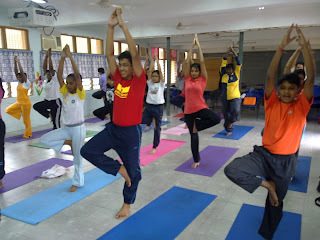 Yoga can make children more eager to learn, attentive, receptive, responsive, creative & communicative in the school. - One must remember that sole purpose of practicing Yoga is for physical, mental, spiritual health, so that the body is fit to accept higher knowledge, which is necessary to attain Self knowledge. Any other purpose apart from this makes Yoga gymnastic, aerobics or other fussion, an injustice to the Lord and Patanjali Maharishi who codified the Yoga Shastras. - Only serious knowledge seekers are welcome. - Classes will be conducted in Tamil and notes will be given in English.